Stay alert and on top of your game, no coffee required. This comprehensive blend of ingredients is here to solve your brain-fog woes. How was your overall experience with LIVELI? Our co-founders and Stanford-educated MDs, Dr. Tess Maurcio and Dr. James Lee, are here to answer all your questions. How do I use Focus Clearli™? 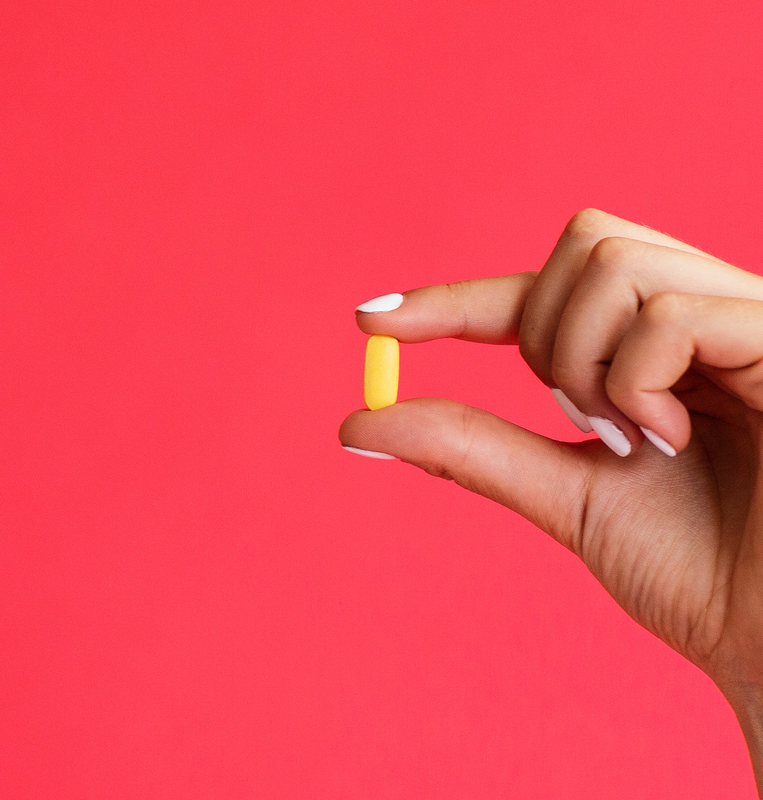 Take one packet (1-2 tablets) about an hour before you need to be at your peak performance. Always take with food or right after a meal, and if you are sensitive to caffeine or dehydrated, avoid caffeinated drinks with Focus Clearli™. Now you’re ready to get in the zone! How does Focus Clearli™ differ from drinking coffee? Is it better? Focus Clearli™, like coffee, contains caffeine. Caffeine is a potent nootropic and has been shown to support memory and learning by ramping up the brain system. * We use Green Tea Leaf Extract (which contains caffeine) so you can stay energized throughout your day – which is why you won't feel a jolt, like a cup of coffee might give you. Combined with Korean Ginseng to support mentation, L-Tyrosine to support mental performance, and Bacopa to support memory and attention*, Focus Clearli is so much more than your afternoon cup of joe. 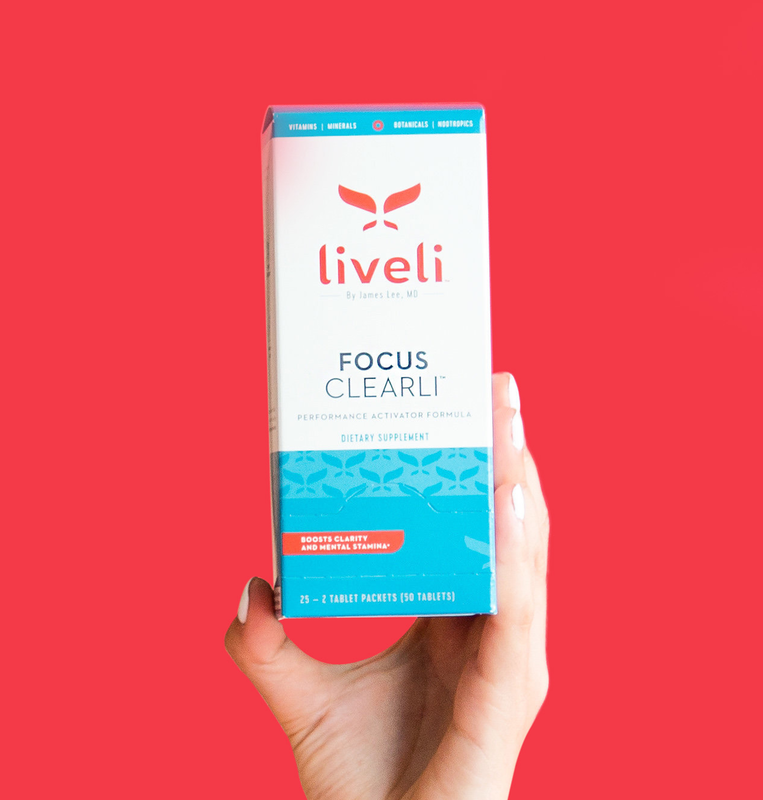 All of our formulas, including Focus Clearli™, have been designed to support the different phases of brain function – think of the effects like a gentle, balanced swing rather than an on/off switch. * This way, you won’t feel a crash, but rather a gentle coast back to your baseline. You sure can! Customers may notice that they require less coffee, but everyone is different. 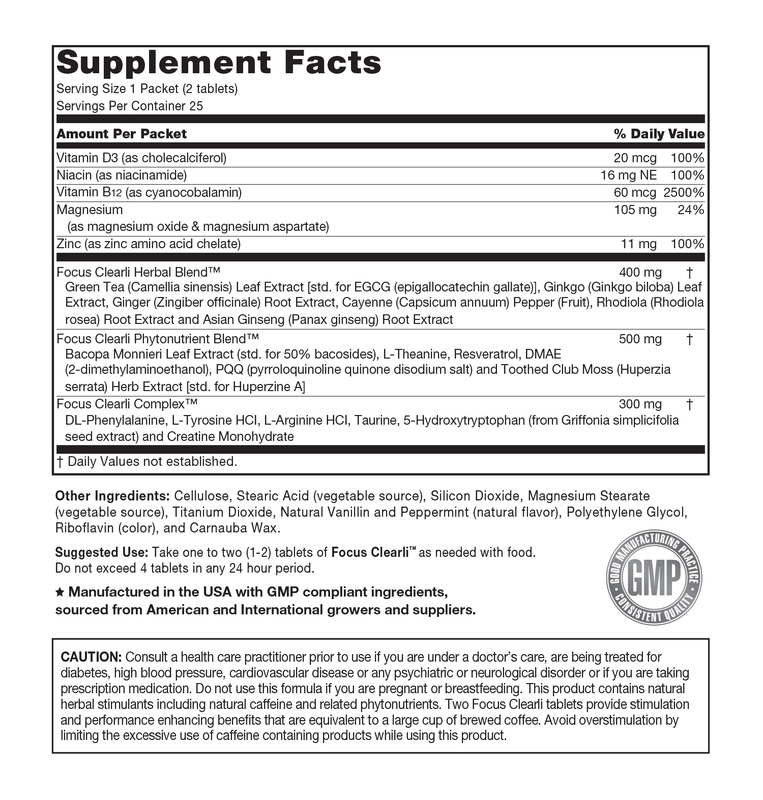 Focus Clearli™ contains a specific, safe amount of natural caffeine from green tea extract. However, if you are sensitive to caffeine or dehydrated, we recommend avoiding caffeinated drinks with Focus Clearli™, and always take with food. We’ve included our recommended one month’s supply, representing 5-6 days a week. Taking one or two days off per week is a good idea for almost everyone. If I take Focus Clearli™, will I be able to fall asleep? We recommend to take Focus Clearli when you have at least 5-6 hours before going to sleep. We also suggest taking Sleep Peacefulli in the evening after a busy day! Why do you use proprietary blends? We formulate our products in unique blends of diligently researched ingredients. While we make these blends proprietary information to avoid duplication, we ensure that we include bioactive amounts of each ingredient to make each blend effective. We don’t believe in ingredient fillers! The entire nootropic power trio. Delivered monthly with Free Shipping with every subscription. Products will be automatically filled in your selected timeframe. Cancel or adjust your delivery schedule anytime in your Liveli account. Love this product? Subscribe to the All In System and Save 10% on the full stack.